Unfortunately, the login information you provided is not registered with AgriLender. Please Re-Enter Login Name and Password. 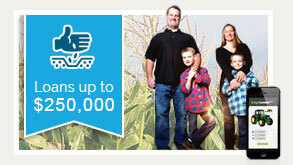 Get an unsecured farm loan to finance farm land and equipment - up to $40,000, without putting up any collateral. You also have the option of applying for a business loan up to $500,000. Farming in today's economy is a challenge. At AgriLender™ we understand that a slow season can be devastating to a farmer's cash-flow. What about multiple slow seasons? Droughts, late frost, early freeze, and excessive rainfall are all uncontrollable factors which can contribute to a farm's financial collapse. We know how important it is for a farmer to have access to quick cash in the form of unsecured loans. Because many farmers already have their land and equipment held as collateral for secured loans – AgriLender™ is proud to offer low APR, unsecured loans online, in amounts up to $40,000. From the convenience of your home, you can apply for an unsecured farm loan at AgriLender, offering fair rates & quick cash - available in as little as 48 hours! If your farm is in a position where it requires an influx of capital to survive, AgriLender™ encourages you to learn more about the fixed rate loans and lines of credit we offer online. Apply whenever you are ready and receive up to $500,000 in as little as 48 hours. If you know the type of loan you wish to apply for, select one from our list. Don't see a loan for your specific need? Just click the 'Apply Now' button located below and start your application. Farm loans are available for any farm related expense. Have 2 minutes? Check your loan offers!